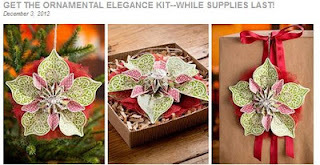 The ornament on the cover of our holiday catalog is such a hit that Stampin' Up! is making it available to you–just in time to deck the halls with terrific trimmings you’ve made yourself! We’ve simplified this fun project so that you can quickly and easily achieve the same results. In addition to the kit, all you need is a glue gun, scissors, and adhesive. (Our Anywhere Glue Sticks  are perfect for assembly.) 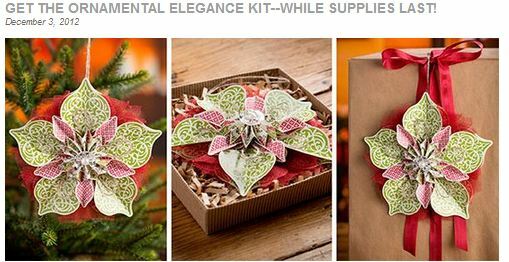 Want greeting or place cards to go with those ornaments? The Ornament Keepsakes Stamp Set (W 128048 C 128051) gives you perfect coordination. Fancy a little sparkle and shine? Sprinkle on our Dazzling Diamonds Stampin’ Glitter (102023)! ORDER QUICK – while supplies last- they won’t last long.